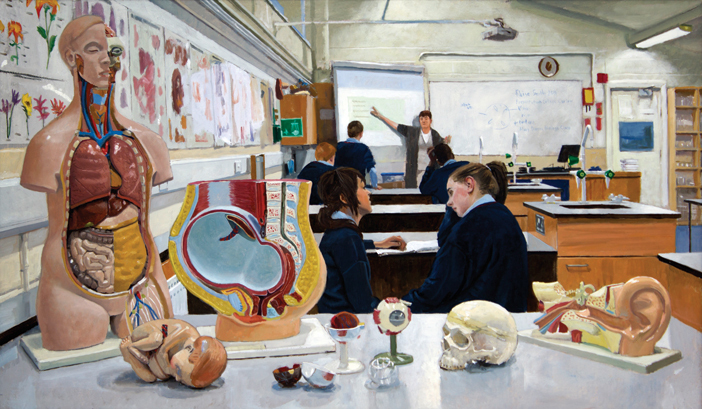 The collection of 20 paintings produced for this commission provided a unique insight, relevant to both now and into the future, of daily life for students and staff in a modern secondary school in Ireland. ‘Schoolwork’ has been exhibited extensively in Ireland and the painting, ‘Home Economics Room’, from the collection is currently exhibited at the BP Portrait Award Show in the National Portrait Gallery in London. When Presentation College, a co-ed secondary school in Carlow, built an extension onto the school funding was set aside to commission artwork for the school. Ray Murray became principal of Presentation in November 2007 and saw the potential that funding had. “Before my time there would have been some discussion at staff level about it, but we started looking at it again in greater detail. We engaged Sharon Murphy, a consultant who had worked on other PerCent for Art projects, and created a steering group comprising board members, parents and students,” says Murray. A brief was developed and nearly 100 artists applied, with the group shortlisting five who met with them to discuss their vision for the project. “We wanted something that was going to connect with the school. We didn’t just want a sculpture or painting but someone who could make an impact. Blaise Smith was our final choice, and it was a perfect one,” says Murray. Artist Blaise Smith, who lives in Kilkenny, won the commission with his proposal to come into the school and spend three to four days each week engaging with pupils and teachers. He wanted to depict the Irish education system today but in doing so would interact with the students of Presentation College and allow them to see and converse with an artist at work. That interaction became a vital part of the process, and led to Smith filming the students’ reactions to his work. “I paint from life. I can’t take a photograph and paint from that. I have to stand in my environment and I wanted to be in the school and paint the classes as they happened. Although 20% of the population are involved in education at any one time, there really aren’t many images of the system in action,” says Smith. Not only did Smith sit at the back of the class but he also had students pose for “hours and days on end”. Smith proposed to do 16 pieces but ended up with a collection of 20, entitled Schoolwork. He also provided the school with almost 100 sketches of his work in progress. Paintings include an Irish oral taking place and depictions from biology, home economics and IT classes. There are paintings of sports classes in progress, and one of rehearsals for a school play, Blood Brothers. Smith has created Irish history in the making. One of his paintings depicts a mountain of books belonging to a first year. This year, 105 of the 142 first year students at Presentation College will have iPads as bundles of text books become a feature of the past. “We were very happy with the whole process and very happy with Blaise. Sometimes schools and teachers can be a little bit insular and wary of people coming into the classroom – but there was no issue at all and Blaise was there in the back of many a classroom. He just fitted into the school,” says Murray. “I was really lucky to get the submission, which was very highly subscribed, at a time when all the artists in the country had been eviscerated,” says Smith.